Several weeks ago, we talked about bringing our giant Digi-Comp II to Maker Faire. But now we’re back, and we wanted to show everyone how it works– not just the many folks who came by to see it at Maker Faire. For those of you just joining us: The Digi-Comp II is a classic 1960’s educational computer kit– an automatic binary digital mechanical computer, capable of conducting basic operations like adding, multiplying, subtracting, dividing, counting, and so forth. These operations are all conducted by the action of marbles rolling down a slope, directed by mechanical switches and flip flops that act as logic gates. Our version is a modern, larger-than life remake. 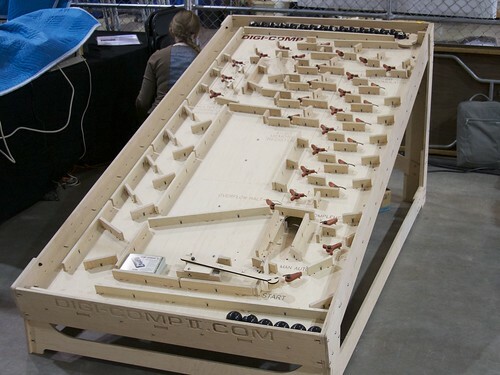 A functional clone, but sized up to use billiard balls instead of small marbles. The machine is big at roughly 4×8 feet, and somewhat difficult to video or photograph. To get the overhead view for our video, we ended up moving the machine out to our loading dock and standing above it. The overview shot above required the further assistance of a ladder perched above the edge of the loading dock. You can find additional photos of our giant Digi-Comp II in this flickr photo set. See also our prior blog post about this machine, and, of course, digi-compii.com for future updates. This entry was posted in Education, EMSL Projects and tagged digi-comp II. Bookmark the Permalink. Will you be doing a more powerful version of the Digicomp I? Nope. 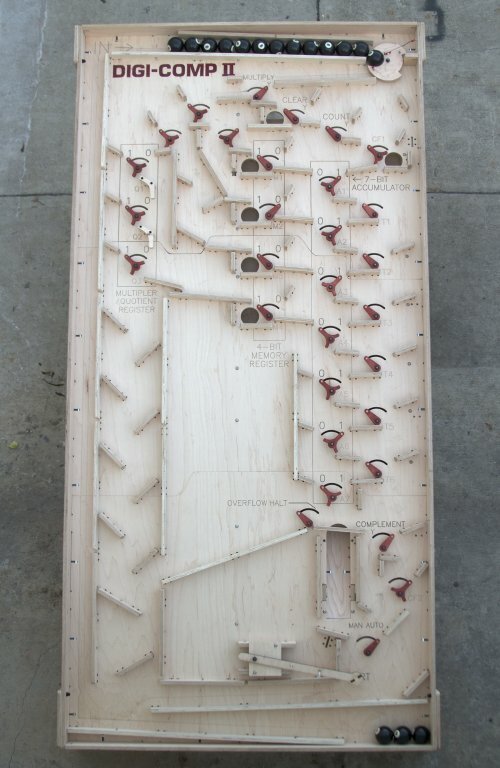 There’s already a Digi-Comp I kit available ( http://www.mindsontoys.com/dc1_main.htm ), and we don’t want to step on their toes. Besides, we’re big fans of rolling balls! Kudos to the camera guy… "On a ladder on the edge of the loading dock"… That will make ya pucker. There is something almost magically about these mechanical logic devices. It’s as if we are physically transported to seeing things as they happen at the speed of light inside a microscopic silicon wafer encased in resin mold. Amazing demonstration tool! Question : is this a Turing Machine? No, it is not a Turing machine.